UPDATE: Due to heavy snowfall, the event has been rescheduled for March 12, 2015. Join Mickey Getty at The Speckled Hen Cottage Pub & Alehouse in Reading, PA on March 5, 2015 from 5:30 pm. 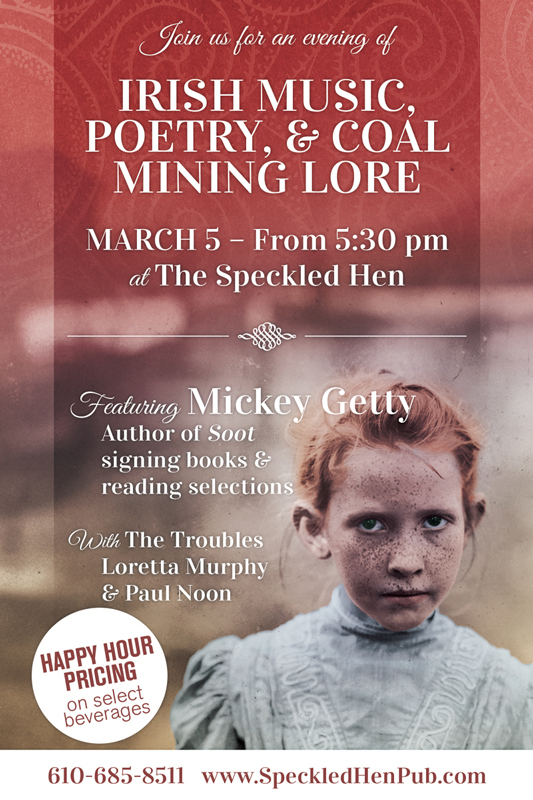 The event consists of an evening of Irish folk music, poetry, and coal mining lore, and features Mickey Getty reading selections and signing her new novel, Soot. Musicians Loretta Murphy and Paul Noon will perform Irish folk music and more at 5:30 and 7:30 pm. Contact The Speckled Hen to reserve your table today!